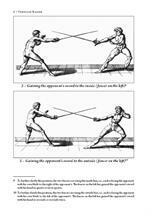 Perhaps no other weapon represents Renaissance Italian fencing like the rapier. But do we know how it was used and how it was taught? 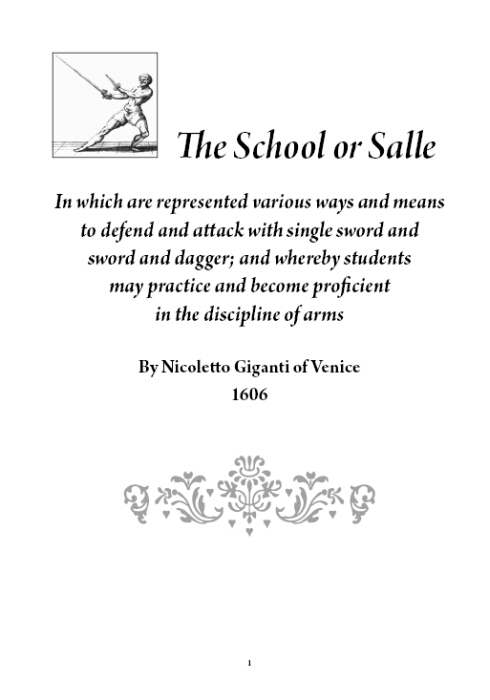 This book takes you to the fencing School, or Salle of celebrated renaissance rapier Master Nicoletto Giganti of Venice, one among the period teachers leaving instructions on the use of this weapon. 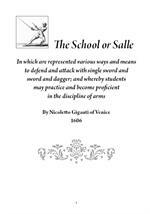 More uniquely, his 1606 text The School, or Salle is a veritable training curriculum, with its stepwise lessons and easy-to-follow explanations on the use of the rapier alone and rapier and dagger. 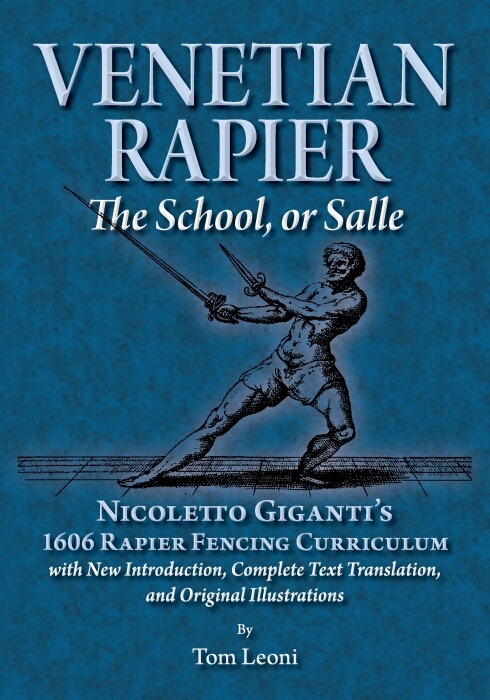 This faithful translation of Giganti’s The School, or Salle by internationally-known rapier teacher Tom Leoni includes the complete text, original illustrations, and an introduction on rapier fencing that will make Giganti’s text easy to follow. 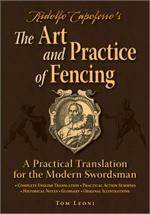 If you are a martial artist, a fencer, or have an interest in European martial culture, this book belongs on your shelf. 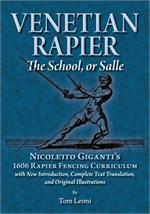 I just received my copy of Venetian Rapier yesterday and read it cover to cover in one sitting. Today I read it again. 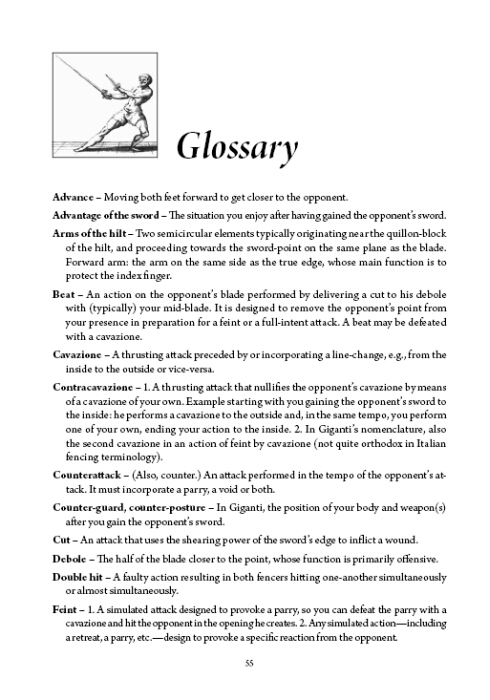 I've had some cobbled together translations of different sections of this work that I've used in the past, and none of those were things I could easily read. 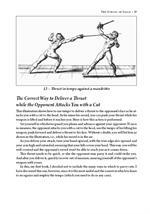 Tom's translation reads just like the book were written originally in modern English. 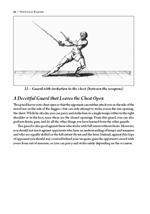 Plus, this is one of those works that really is just very user friendly. 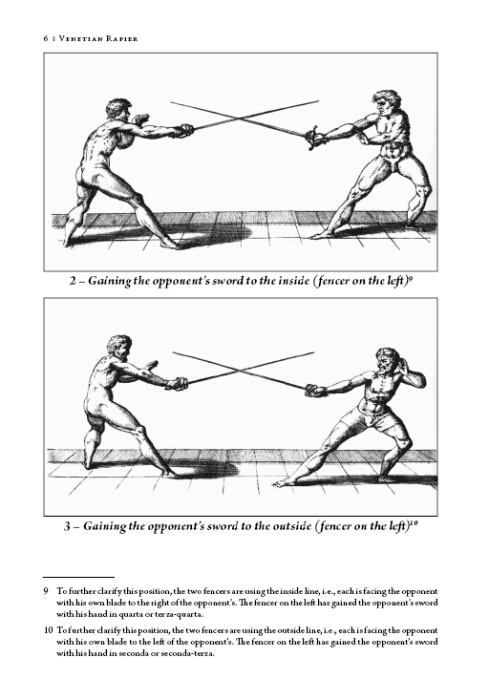 Its much more concise than works like Fabris, and a heck of a lot easier to understand than Capoferro, and its even more pragmatic than Alfieri. While Fabris still ranks as my personal favorite, Giganti's work is a close second, thanks to how well he sums up the art in so few words. Its become ten times more enjoyable with Tom's wonderful translation. Thank you, Tom, you've done yet another wonderful service to the community! 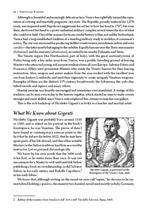 My copy of Venetian Rapier arrived today. I haven't had the chance to read it cover to cover, but I've made fair progress on it. 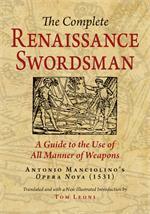 This is a very sharp, smart, focused book, with simple, clear instructions. 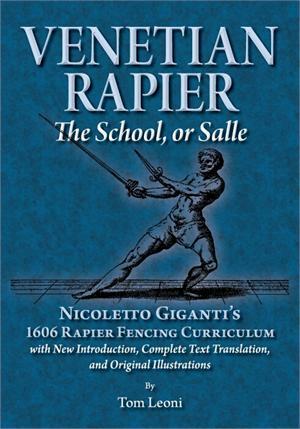 This is a book clearly written more to students than instructors, and bridges the gap between Treatises like what Fabris wrote, and the more modern how-to book with a series of drills and lots of step by step, inch by inch sort of descriptions, such as Maestri Barbasetti and Gaugler have written. 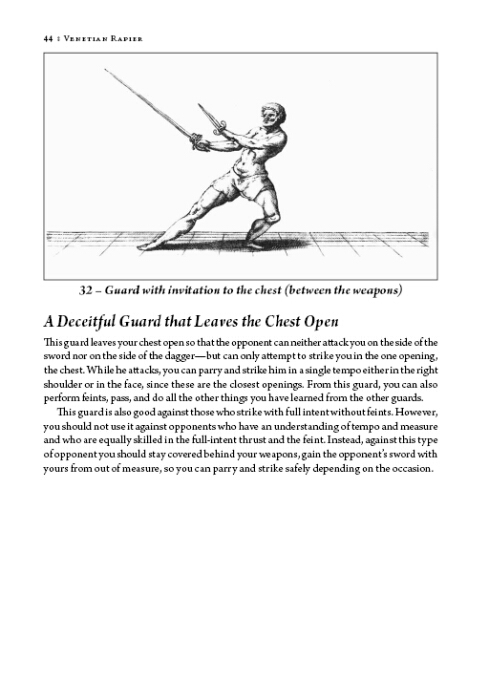 This is a must have for Italian rapier fencers, and frankly should be a book that all Italian fencers of later systems own as well—if for no other reason than it shines a great deal of light on where the later systems come from, and is a fantastic buy. 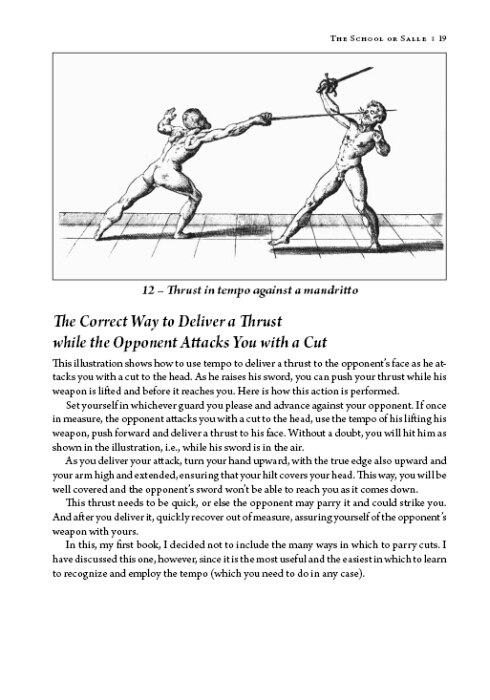 Physically, the book is a rather nice perfect-bound paperback, with good print quality on nice paper. 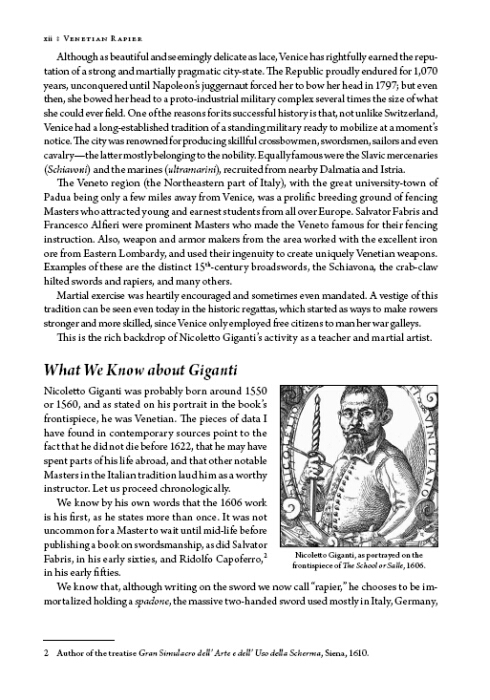 If you want to have any hope of claiming to be well read in Italian rapier literature, Giganti is a must.